Montan wax is a hard mineral wax obtained from lignite and peat. It was first produced in northern Bohemia (the Czech Republic) in the late 1800s. The crude wax obtained is dark brown; however, the wax turns light yellow to white in color after purification with solvent extraction. Montan wax has been used as a substitute for carnauba wax and beeswax. It is hard and brittle and has high melting point. Montan wax is also known as lignite wax or OP wax. Commercially viable deposits exist in a few locations. These include Amsdorf, Germany, and the Ione Basin, California. Montan wax is available as crude wax or refined wax. Refined wax is also called bleached wax. The global montan wax market is anticipated to expand at a significant pace during the forecast period primarily due to the rise in demand for wax polishes in automotive and furniture industries. The montan wax market was valued at US$ 118 thousand in 2017 and is expected to expand at a CAGR of more than 4.0% during the forecast period. Increase in demand for fruit wax is boosting the demand for montan wax. Demand for montan wax in is high, as it provides edible coatings and films for fruits. The wax coating helps improve the shelf-life and the quality of fruits and vegetables. Key players operating in the global montan wax market need to focus on promoting benefits of montan wax. Major players are engaged in establishing new facilities and entering into acquisitions and mergers to develop and launch new products. These strategies are likely to propel the montan wax market during the forecast period. On February 26, 2018, Clariant launched a family of high-performance waxes based on renewable feedstock. This is a non-food-competing by-product from the production of rice bran oil and is available in large quantities. In August 2017, ALTANA acquired a technology portfolio and R&D platform from NuLabel Technologies, Inc. based in the U.S. It comprises innovative technologies of additive manufacturing of sustainable decoration solutions as well as novel technology for resalable packaging. 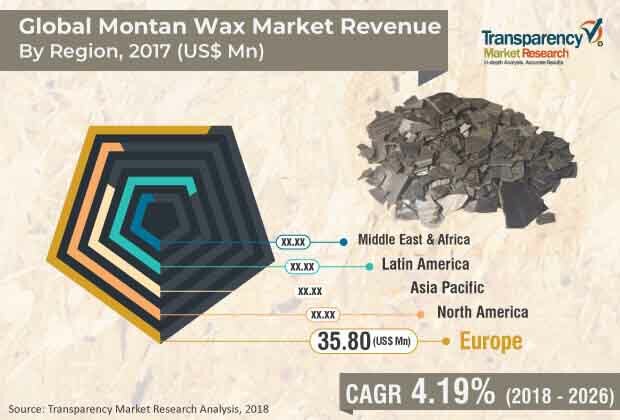 Based on end-use industry, the global montan wax market has been divided into cosmetics, pharmaceuticals, rubbers, plastics, electrical, wax polishes, machinery, agriculture & forestry, leather & textiles, and others (including metal, wood, and stone). Montan wax is primarily used for wax polishes. It is used for floors, furniture, leather care polish, and car polish applications. Wax is helps improve feel and appearance of materials and surfaces. Furthermore, montan wax is employed as high performance additive in the plastic industry. It is used as combined external and internal lubricants, nucleating additives, and dispersing agents in various types of plastics and processing methods. Based on region, the global montan wax market has been segregated into North America, Europe, Asia Pacific, Middle East & Africa, and Latin America. North America and Europe are key regions of the global market. In terms of consumption, Europe holds major share of the global montan wax market. The montan wax market in Germany and Russia & CIS is anticipated to expand at a rapid pace during the forecast period. China is a prominent consumer of montan wax in Asia Pacific. Middle East & Africa and Latin America are emerging regions of the global montan wax market. Key players operating in the global montan wax market include ROMONTA GmbH, Clariant, Mayur Dyes & Chemicals Corporation, S. KATO & CO., Yunphos, Poth Hille, Frank B. Ross Co., Inc., Völpker Special Products GmbH, FIRST SOURCE WORLDWIDE, LLC., AmeriLubes, L.L.C., Carmel Industries, Parchvale Ltd., MÜNZING Corporation, and ALTANA. The report comprises detailed value chain analysis, which provides a comprehensive view of the global montan wax market. The Porter’s Five Forces Analysis model for the montan wax market has also been included to help understand the competition landscape of the market. The study encompasses market attractiveness analysis, wherein function and end-use industry segments have been benchmarked based on their market size, growth rate, and general attractiveness. The study provides a decisive view of the global montan wax market by segmenting it in terms of function and end-use industry. Segments have been analyzed based on present and future trends. Regional segmentation includes the current and projected demand for montan wax in North America, Europe, Asia Pacific, Latin America, and Middle East & Africa. The report also covers the demand for montan wax in individual function and end-use industry segments across all regions. Key players operating in the global montan wax market are ROMONTA GmbH, Clariant, Mayur Dyes & Chemicals Corporation, S. KATO & CO., Yunphos, Poth Hille, Frank B. Ross Co., Inc., Völpker Special Products GmbH, FIRST SOURCE WORLDWIDE, LLC., AmeriLubes, L.L.C., Carmel Industries, Parchvale Ltd., MÜNZING Corporation, and ALTANA. Market players have been profiled in terms of company overview, financial overview, business strategies, and recent developments. The report provides size (in terms of volume and value) of the montan wax market for the base year 2017 and the forecast for the period between 2018 and 2026. Market numbers have been estimated based on function and end-use industry segments. Size and forecast of each major function and end-use industry segment have been provided in terms of the global and regional markets.